The evidence is just so much against this technology, it’s difficult to believe how long it has existed as a supposedly valid notion. 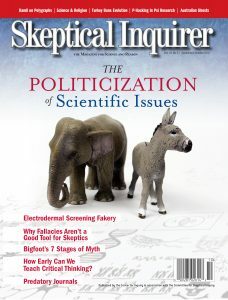 It is paradoxical that in populations supportive of science and democracy scientific issues have become politicized to the degree that objective evidence is ignored or rejected in favor of “alternative” opinions. Souped-up galvanometers are being used to assess people’s health and determine what they supposedly need. Tests expose them as preposterous, and government agencies should stop their use.